With the former RBG trail system mostly under pavement since the late 1960s, there remain limited opportunities to hike the natural trails that once threaded their way through Coldspring Valley Nature Sanctuary. Having the former trailheads -- at Thorndale for the "Maria's Walk" trail, and Lakelet Vale which lead to the Rim Circuit trail -- still intact, helps us re-visit the site with our imagination tuned to what it must have been like, and to get our bearings. 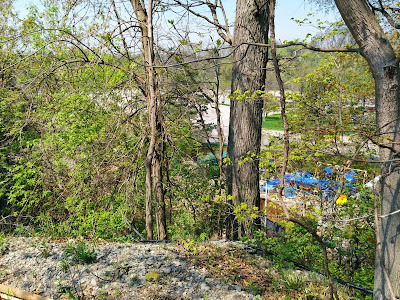 Having pieced together the location of the mostly intact Maria's walk (broken only by the driveway into the west campus), I've never ventured to take in the view that Rim Circuit would have provided. Until now, that is, and while the trail may have vanished beneath asphalt of the campus service building parking and rear service driveway/yard, I still managed to get a feel for how this trail would have been spectacular in its day. It's a steep drop down to the floodplain, which was once covered in a dense marshy woodland. 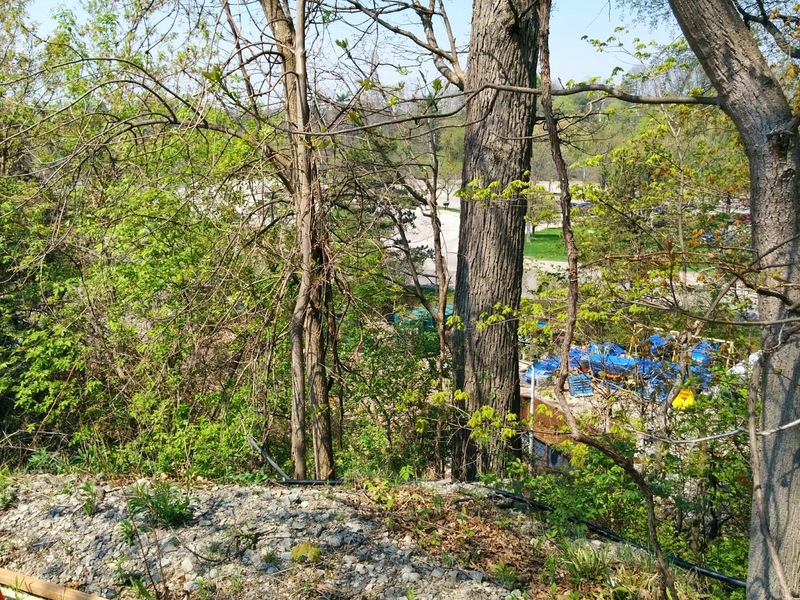 Now the view reveals only a wide expanse of asphalt, even after the removal of parking along a 30 metre buffer to protect Ancaster Creek from surface run-off. The McMaster employees I encountered in the yard were very welcoming, and when I told them why I was there seem genuinely interested in the history of the area. Previously I was worried that I was trespassing in a secure area, but it doesn't seem to be the case. As I write this I think I will go back and seek out the connecting link from the obliterated rim circuit trail to the western Coldspring Path. Anyone want to come along?